iMacsoft DVD Audio Ripper Suite, powerful DVD Audio Ripper and Video Converter suite, is designed just for Windows users. It help you rip audio from DVD audio and convert video to audio, such as video to MP3, OGG to MP3, MP4 to MP3, RA to MP3, MPEG to MP3 with ease. 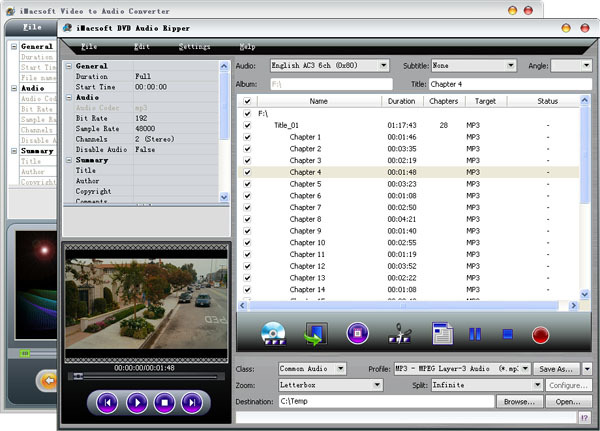 It includes two professional products: iMacsoft DVD Audio Ripper and iMacsoft Video to Audio Converter. iMacsoft DVD Audio Ripper, as best DVD Audio Ripper and DVD Audio Extractor, can rip audio from DVD, rip DVD audio. With iMacsoft DVD Audio Ripper, you can extract audio from DVD movie to MP3, MP2, M4A, WAV, WMA, AAC, AC3, OGG, RA audio formats with excellent sound quality. iMacsoft Video to Audio Converter, professional Video to Audio Converter, can convert MP4 to MP3, MPEG to MP3, OGG to MP3. This Video to Audio Converter also rip popular video files (MPEG1, MPEG2, MPEG4, WMV, AVI, MP4, 3GPP, 3G2, MOV, RM, RMVB, OGG, DV, H.264/AVC) to popular audio formats such as MP3, WAV, AC3, WMA, M4A, OGG, AAC with fast ripping speed. Just feel free to download iMacsoft DVD to Audio Suite and to colorize your digital entertainment life.